If DOT is going to implement a safer design of 111th Street in Corona, it won’t be thanks to the local community board. Despite a watered-down safety plan intended to appease opponents of DOT’s original proposal, the CB 4 transportation committee declined to vote on the plan, citing “remaining questions” about traffic on the corridor. 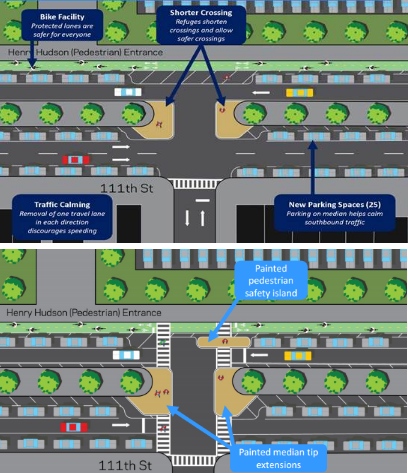 The city’s first plan for 111th Street, which local residents, community organizations, and Council Member Julissa Ferreras had pushed for, would have reduced the number of motor vehicle lanes, narrowed crossing distances for pedestrians, added marked crosswalks, and put a two-way protected bike lane along Flushing Meadows Corona Park. That version was opposed by Assembly Member Francisco Moya, who said 111th Street carried too much traffic during large sports events at Citi Field and the U.S Open to eliminate moving lanes. DOT studies and video evidence suggested Moya didn’t have a leg to stand on, but in an announcement last month, the city revealed a weaker version of the redesign, saying it had won over Moya while retaining support from the original coalition. The new design retains a two-way protected bike lane and wider medians, but only eliminates one moving lane in each direction, maintaining two southbound lanes instead of one. It also does not include some marked crosswalks that were in the original plan. Last night, DOT reps came equipped with piles of research about the traffic conditions on 111th Street, including time-lapse photos from two locations on the corridor and traffic studies of more than 30 large events in the area. Residents were also surveyed about how they get to the park and their concerns about park access. The traffic studies concluded that there just isn’t much congestion on 111th Street, and the survey revealed that Corona residents are much more worried about speeding on 111th Street than about traffic back-ups. But CB 4 members refused to believe the evidence. Committee chair James Lisa suggested, absurdly, that DOT must study building an exit ramp from the Grand Central Parkway directly into the park, so buses carrying students to museums would not stop on 111th Street. He also refused to accept that the current highway-like conditions on 111th Street are dangerous, even though 23 pedestrians, 24 cyclists, and 92 motor vehicle occupants were injured between 2010 and 2014. Moya was present last night and despite saying last month that he supports the revised plan, he repeatedly echoed the ridiculous assertions from Lisa and District Manager Christian Cassagnol. Lisa abruptly tabled the proposal himself, without a vote. One committee member, Sandra Munoz, spoke out against Lisa’s handling of the meeting. “I think the motion was made a little prematurely,” said Munoz, who struggled to get a word in edgewise as Cassagnol and Lisa silenced and shushed her. Members of the public were not invited to speak, as is common practice at community boards across the city, and some members of Mujeres en Movimiento, a neighborhood advocacy group, were denied entry altogether. Cassagnol made the point multiple times that CB 4 isn’t technically delaying the project’s implementation — and he’s right. Mayor de Blasio and DOT can move the project forward, as Council Member Julissa Ferreras-Copeland and the coalition of groups supporting the project have said he should. Until then, the lives of the Corona families who use the park every day are needlessly at risk.